Leveraging on the industrial experience of our professionals, we have been able to offer a wide range of Counterbalanced Hydraulic Floor Crane that are available with Lifting Heights of 2500 MM with different Lifting Capacity. The pictures shown are our artistâ��s impression only and are only indicative of our capability. 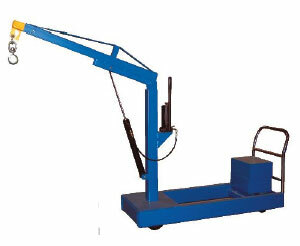 (For display purposes only) All Hydraulic Floor Cranes (Counter Balanced Type) are made individually and the design may be subject to change according to your required specification; the pictures are not to scale, general arrangement drawings will be issued for approval on receipt of your order. Stainless steel option is also available for the Counterbalanced Hydraulic Floor Crane, please phone or request a quote by clicking on to the BUY/Quote tab. Brakes with locking Castor and directional locking Castor's / wheels.